Celery Root. 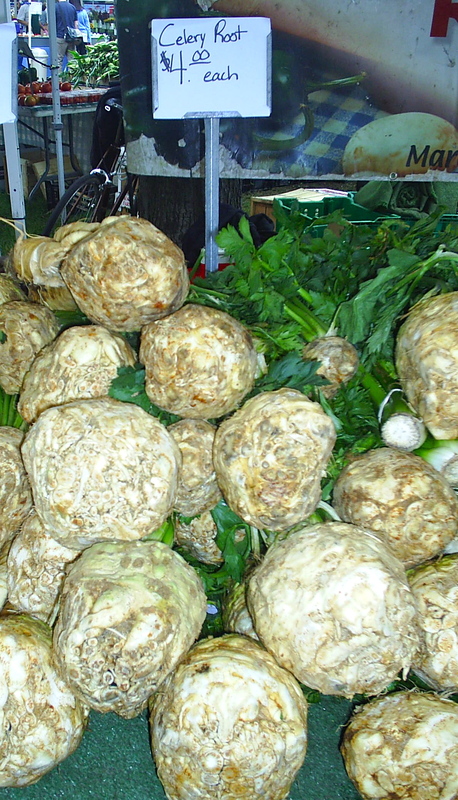 Celeriac. Hum, just don’t know where to begin with you. I just sit here staring at you and…..nothing. Awfully American of me I suppose. Not only do we want you to taste good, but gosh darn it, you better have good looks that indicate such. But you? You, you, you just don’t send off that ‘good looks equals good taste’ signal with your, how shall I say it, your, not so appealing looks. Sorry. Clearly the French don’t judge taste ‘by the cover’ as they are big fans of celeriac. I mean, can you walk into a bistro in France and not find celeri remoulade on the menu? Oui, I thought not. Get past that brownish, gnarly exterior — I suggest a paring knife as opposed to a vegetable peeler, and underneath lies a smooth, milky-white, aromatic flesh. The smell and taste are refreshing, grassy, nutty, and king of lemony all at once. And yes, as the name implies, a bit like celery. Celeriac loves to be paired with apples, parsley, potatoes, lemon, and what it does with cream? Heaven. It adds a great crunch to any salad or crudite platter. And cooked? Glazed, roasted, mashed, as a gratin, or added to soups and stews, on its’ own, or with other root and Fall veg. For all of you carb counters out there, celeriac, which is only about 5% starch, is a great stand in for the spud and is low cal, and high in fiber and vitamin K to boot. Right now (Fall) is the best time of year to enjoy Celery Root at it’s peak. Look for firm and unblemished roots about the size of a baseball. Once peeled you will loose about a quarter of the root so factor that in when cooking. Though a huge fan of the celeri romoulade the cooler days just said soup to me. And as soup, celeriac cooks down into silky sublimeness in a bowl. And with truffle oil to boot? oh la la. chopped parsley and celery leaves tossed with a bit of olive oil and lemon juice. Sprinkle on soup just before serving. In soup pot, saute onion in butter and olive oil for about 5 minutes or until onion is tender and translucent. Add celeriac, potatoes, thyme, and stock to the pot. Bring to a boil and then simmer for about 40 minutes, until veg are tender. This is where you can add cream, or not. Bring to a boil again, then remove the bundle of thyme. Remove pot from stove top. Puree mixture in batches in a food processor or blender or break out the ‘boat motor’ and puree away. Season with salt and pepper to taste. Add truffle oil a tablespoon at a time until reach desired flavor (strength of flavor can vary depending on brand and whether using black or white truffle oil.). 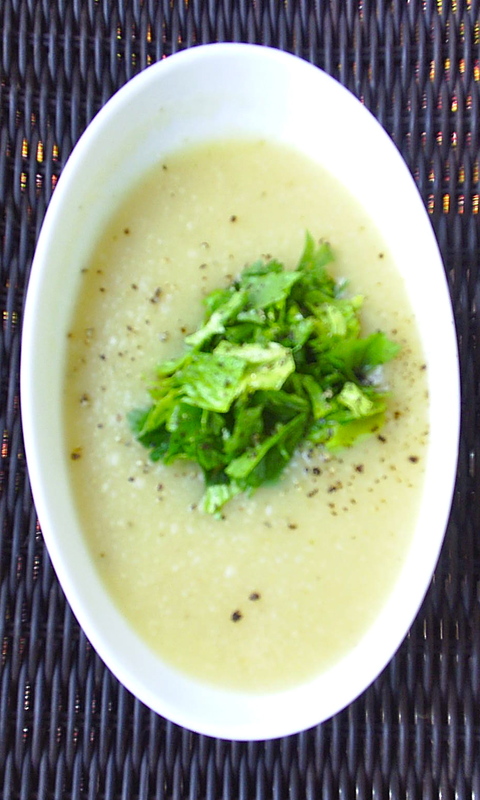 Divide among soup bowls and garnish with the parsley, celery leaf salad. P.S. This past Sunday was the final outdoor market for the Glenwood Sunday Market. Here’s to a FANTASTIC first season. And so excited — The Glenwood Sunday Market will move indoors thru the winter, the second Sunday of the month beginning next month! What are you favorite indoor winter markets? This entry was posted in To Market with Mo and tagged Celeriac, Celeriac & Potato Soup, Celery Root, Chicago Area farmers marekts, Chicago Farmer's Markets, Evanston Farmer's Market, Farmers Markets, fresh organic, fresh seasonal organic produce, Glenwood Sunday Market, Green City Market, Henry's Farm, Jamie Olivier, moira's blog, Nichols Farm, sustainable, to market with mo. Bookmark the permalink.